An update of the 62, this is the Princess 64 which got most of its success from big families or the charter friendly four cabin layout. But if this not your take Princess still can change the twin bunk fourth cabin to a private study office. The Princess 64 enlarges all windows of the 62 from those of the main living deck which serve the saloon, to those below in the cabin areas. An extension of the aft bathing platform now with up and down movement for easy tender launching and recovery has also been made. The aft deck has also been made larger and now features two way entrance from the bathing platform, and a central settee served with a teak table. Three engine choices power the 64 from standard 900hp Volvo, or optional Cats 1015hp, and 1150hp. 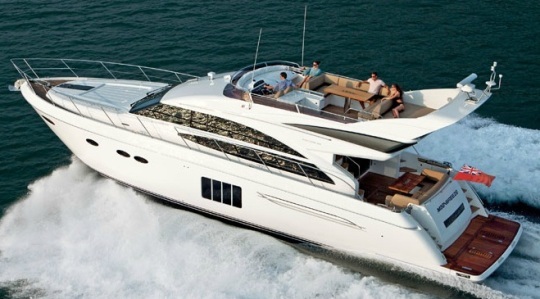 This last option gives a max speed up to 34 knots.